Okay, okay, okay. WHY have I not posted in a week? I’m blaming it on two things: photographs and my idiotically s-l-o-w laptop. I have now written this very post twice because my laptop keeps crapping out on me. I mean, I think when it’s taken me fifteen minutes just to check my e-mail…Houston, we have a problem. I bought my laptop in like…2003? The Dark Ages! Needless to say, it’s time to upgrade. I’ll get right on that as soon as dollar bills rain from the sky. And as for photos, well, they just take FOREVER to download, edit, and then upload. If I could take a photo and then immediately post it, or if I wrote a blog that did not require photos at all, well then, I’d be a regular spew-er of blog posts! But who cares about that?! Here’s what’s cooking in the AFFFG kitchen: fruit liqueurs. MMMMM! One gets a little tired of jamming in the heat of August, so this is a nice alternative for what to do with all your summer fruit. Also, this ensures that I WILL be having a great autumn this year. Glug, glug! Mix the apricots and vodka together. Store in a cool dark place for one month. My guru says not to add the sweetener until the fruit and vodka have had a chance to mingle for a month. So that’s what I’m doing. Last year I added everything at once and that seemed to work fine, but I figure the guru must know what he’s doing, so I’m giving his method a shot. We’ll check back on this in a month. That’ll keep you on the edge of your culinary seats, right? I need a drink! Dear readers, my apologies for the neglect. This time of year is just so chaotic, it’s ridiculous. 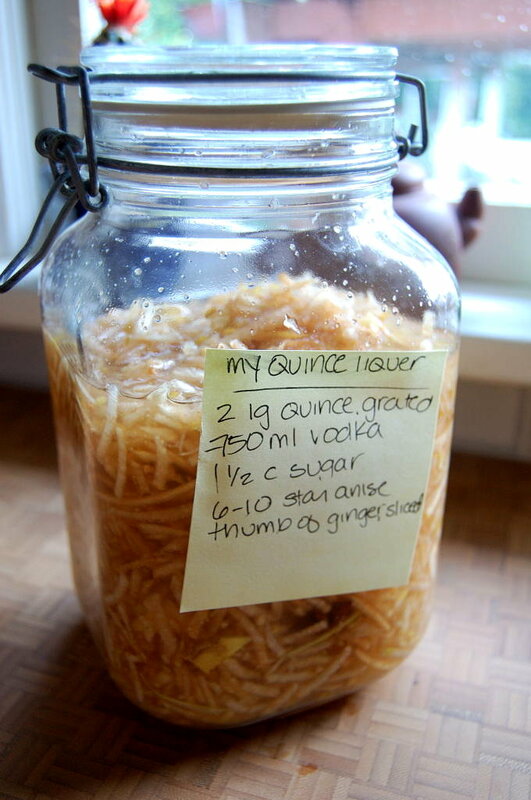 Remember way back in another galaxy when I made that quince moonshine? Well, I also made some apple moonshine, aka calvados from a big bushel of apples The Man brought home from the farm where he was working. It’s incredibly easy. And if you get on it right now, it’ll be ready for your big toast to 2009, which at this point seems like just hours away to me. The recipe is on the post-it in the picture. Put all that stuff into your jar and shake it every day for a week. (Store it in a cupboard; you don’t need to refrigerate). Then, shake it once a week for a few weeks and you’re good to go. The apples will turn a bit dark; that’s natural, no worries. It tastes super good. Garnish with candied ginger and a cranberry. The Apple Pie is on the left; the Quince-Ginger is on the right. I’ll leave this as-is for a week, shaking it once or twice a day. Then, I’ll put it in the cupboard and shake it once a week. I’m hoping it’ll be done by Thanksgiving, but if not, I’ll have something to look forward to for New Year’s.